Today’s employees live in a world of added workplace incentives. From free yoga classes to flex hours, traditional health benefits aren’t appreciated as they once were. Additional perks like RRSP-matching, stock options and commissions are used as tools by companies to recruit top talent. This strategy is commonplace in Canada, where we’re expected to face a labour shortage for tech jobs by 2020 (1). Added employee benefits aren’t new. A 2015 New York Times article reads “Of course, companies have long rewarded top executives and rainmakers with bountiful bonuses — and that continues to be true — but compensation experts say the prevalence and types of one-time rewards and perks have spread further down the ranks than ever before” (2). One special incentive stands out amongst many others: the partnership agreement. A candidate at a president/general manager level can sign one for partial ownership of a company. According to Forbes, this agreement creates “A partnership [that] is similar to a sole proprietorship, and each partner owns a portion of the business’s assets and liabilities” (3). To many candidates, this represents an exciting opportunity. However, statistics show that up to 70 percent of partnership agreements fail (4). Patrick McCabe is a Chartered Business Valuator who noticed this problem and was “Concerned that many Canadian Entrepreneurs may be jumping the gun into potentially bankrupting business partnerships”(5). To help them out, he created The Partner Pitfalls Test in 2018 (5). The test is designed to help people determine whether they should sign a Partnership Agreement with a potential business interest. According to Inc., a partnership agreement should define the role of each person involved. This is important for creating expectations at the beginning. 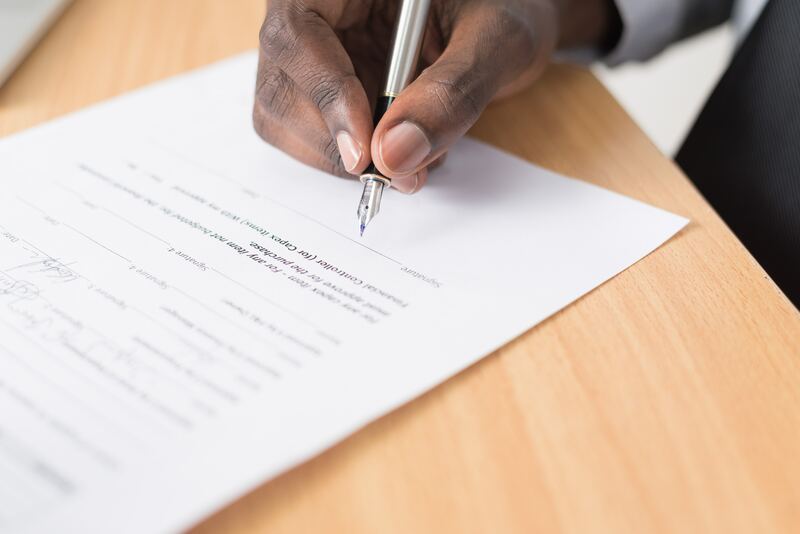 “Partnership agreements are written documents that explicitly detail the relationship between the business partners and their individual obligations and contributions to the partnership. Since partnership agreements should cover all possible business situations that could arise during the partnership’s life, the documents are often complex; legal counsel in drafting and reviewing the finished contract is generally recommended” (6). Always talk to your own lawyer to gauge their point of view and consider risks from their standpoint. Getting help from legal counsel will ensure you understand all the fine print, according to an article by The Balance (7). “As a partnership is a complex issue, we always recommend that people have partnership agreements drawn up by lawyers or other legal professionals who can explain partnership issues in more detail and make sure the partnership agreement says exactly what it needs to say,” says the article (7). “Planning ahead avoids disputes and costly court battles later. No matter how much of a friend your potential partner is, you should never enter a business partnership with him or her without a formally drawn up partnership agreement,” the article continues. No one wants to consider the possibility of failure upon a new partnership. Regardless, it is important to draw up termination conditions as part of your Partnership Agreement. According to Info Entrepreneurs, “Ending a joint venture is always easiest if you have addressed the key issues in advance. A contractual joint venture, such as a distribution agreement, can include termination conditions. For example, you might each be allowed to give three months’ notice to end the agreement. Alternatively, if you have set up a joint venture company, one option can be for one partner to buy the other out. The original agreement may typically require one partner to buy out the other” (8). You may benefit the most from exploring all your partnership options, as there is more than one type. As an example, instead of leaving your business to enter the other one, you could form a business partnership. This can allow for more flexibility (8). You can also arrange a partnership that allows you to work with the other party but in a limited manner. “A small business with an exciting new product might want to sell it through a larger company’s distribution network. The two partners could agree to a contract setting out the terms and conditions of how this would work” (9). Today’s employees can enjoy added workplace benefits, whether that means free yoga classes or RRSP-matching. When it comes to serious offers like a partnership agreement, there’s no magic equation for guaranteeing success. Make sure to hone a version with your lawyer that’s in your best interest. It might also help to treat your business partnerships like a marriage (10). Signing a partnership agreement isn’t just about your partner’s sweat-equity. It’s also about communication, compatibility and enduring the natural test of time to create a thriving business relationship.